This was a fantastic little bit pretty ethnographic in nature. There was plenty of anthropological theory, method and detail to keep the anthropological mind satisfied, but the author was writing for a popular audience...so it was an easy and entertaining read as well. This is a good, interesting little ethnography that I read for my Anthropology class. It was really well written, and I felt like I had an understanding of who Martha Ward is by the end of the book and I quite liked her. While it was interesting, I didn’t find it particularly memorable, and nothing very exciting happened throughout the book.3 Stars. I had to read it for college but it taught me so much about a remote island. There are so many islands out there and cultures are being lost to modern life everyday. If only one person took the time to acknowledge them like in "Nest in the Wind." I am not an expert on anthropology but it's fair to give this four stars because it benefits society. Amazing. Had bits of humor and she wrote beautifully compared to other ethnography's I've read. I had to read this book for college because I'm minoring in anthropology. I always keep books assigned for me to read if they are good and I am definitely adding this one to my anthropology book collection. I enjoyed this thoughtful, straightforward, and sometimes downright hilarious commentary on one particular part of the world and on field work in general. Nice to read because after all, what do you and I know about Micronesia? This book is both heartwarming and heartbreaking - an enjoyable account of the adventure of anthropology, the value of Pohnpeian culture, and the harm of what Ward calls "Coca Cola colonialism." I recommend it a lot if you are at all interested in anthropology or other cultures. This book opened by eyes to differing points of views. It also pointed out how closed our understanding can be to understanding other cultures. A short but well written book. This is one of the only ethnographies that has ever made me cry. Beautiful. A favorite anthropology professor introduced our Gender of Anthropology class to this book, particularly the scene were Dr. Ward analyzes her culture and notices how automatically she took on the housework load, on top of her professional duties. With that in mind, I was excited for a read that would be full of insight on gender roles. Not only that, but Dr. Ward reflects on several aspects of Western culture, injects appropriate humor and, of course, shares information about Pohnpei. Anthropology students will get valuable lessons regarding fieldwork - though you certainly can't prepare for everything that could go wrong, it's always good to carry stories of potential problems. I skimmed this book for the fun of it, but I anticipate another reading and a better review. Regardless, I highly recommend it! Read as a course text for an Introduction to Cultural Anthropology course. I found it quite dry. Perhaps interesting to people who exoticize other cultures, and haven't traveled much outside of the United States. One of best books I've ever read. Martha Ward's writing is sincere and genuine. I couldn't change my major in college at that particular time, but if I ever go back I will probably major in some iteration of anthropology bc of Martha Ward. While an interesting portrayal of a not so well known society, it often varies into problematic territory on the part of the observer (in this case, the anthropologist Martha Ward). Even avoiding that, her focus on her own problems at points detracted from my enjoyment of the book. 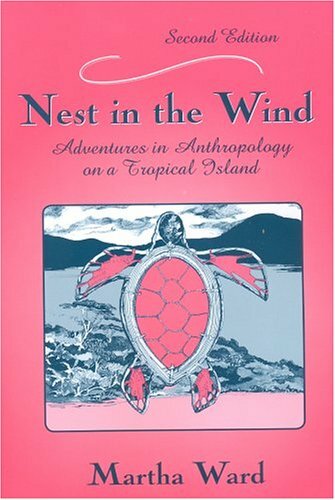 I read this book for the Anthropology of the Pacific class that I took with Dr. Martha Ward. She gave me a B! That's the only B I got in my anthropology classes. I am still holding a grudge. Martha C. Ward - Also writes as Martha Coonfield Ward.